We recently had a dicusssion at work about the power of blogs for generating online sales. Whilst it is clear that Web 2.0 remains a buzz word for many businesses with a strong internet presence, few have maximised it's capabilities. This evening, I saw a TV advert for the LG Freeview Playback TV. As I have been considering purchasing a flatscreen TV for some time, so naturally this caught me attention. I was unable to recall the URL from the commercial so I went to Google and searched for "LG Playback TV'S". The most relevant advert I clicked on was for the LG Blog. This site appeared to be an authentic blog from LG about product releases and news etc. Reading through the blog I became even more excited, by the way that the brand was portrayed and this made me even more keen on the product. In fact, in that moment I was psychologically prepared to make a purchase. If there wasa Buy Now option, I would have clicked on it. The problem was, there was no mechanism in which to do so. I could not find any links on the LG Blog, back to the official LG Website. This make no sense to me. The power of the LG Blog is diluted by the lack of joined up thinking. This leads me to ponder LG's objectives when originally deciding to create the blog. What did they expect to achieve? Why have they done it? How are they measuring the success? It frustrates me when organisations state brand building objectives over sales objectives. Why invest in building a brand if you don't intend to create any more sales? Many organisations can be accused of jumping on the Web 2.0 bandwagon. In order to fully capitalise on the expanding user base and exciting tools available, businesses must incorporate Web 2.0 methods into existing sales strategy and reap the benefits of an integrated marketing approach. Good marketers plan for both internal and external factors. But even the best laid plans can be affected by uncontrollable aspects of the micro and macro environment. Currently it is not possible to purchase the Nintendo Wii in England. That is unless you wish to pay a premium price from the canny eBay and Amazon resellers that have bulk bought in advance. A Nintendo spokeswoman said "The demand has been greater than Nintendo could ever have antcipated". This is somewhat of an understatement, in fact it is estmated that throughout 2007, there will be a shortfall of approximately 3m units. With a recommended retail price of £180, Nintendo is potentially missing out out on a cool £540m! Why is it that there are always demand shortages in the games console market? Sony and Microsoft have previously experienced similar problems with new products. As a marketer, my biggest frustration is unnecessary complications at the point of purchase. The hard work has been done. The prospect has been progressed through the buying cycle. Consumers like the product, but they cannot buy it. They like the price, but they cannot pay it. They are attracted by the promotions , but they cannot take advantage of them. For it is the place element of this marketing mix that is underperforming. What happens to marketing promoting the Wii at this time? Is there any point in marketing a product that cannot be purchased? Should the marketing team be celebrating the effectiveness of their marketing activity or focussing on mitigating the negativity surrounding the shortfall. Perhaps they should turn their innovative minds to overcoming the weaknesses in the production cycle. Whatever they turn ther attentions to, it is clear that measures must be taken in to ensure that the business can capitalize on it's successes in the future. Planning for uncontrollable factors is hard and there are many examples of companies that have got it wrong to spectacular effect. The important thing is to learn from these mistakes and build a mechanism for mitigating the effects. In this instance the Nintendo website doesn't have as much as a press statement. For those that are still hoping to get a Wii for Christmas, Wii-Consoles.co.uk will provide stock updates every 60 seconds. Earlier this year Google announced that they are set to remove their Best Practice Funding. The BPF is a rebate that Google pays to advertising agencies that meet certain criteria to help develop search as an industry, training and research being major criteria. The discount stretched between 3% and 8% depending on the volume of business an agency delivered to Google. There was also an additional discount for agencies that increased their spend by 5% in a a quarter. However it became apparant that some agencies were not using the discount in the way it was intended. Mark Howe, UK Director of sales at Google has referred to the BPF as a "pseudo-disocunt". The reality is that a significant proportion of agencies pass some or all of the rebate directly on to their clients. 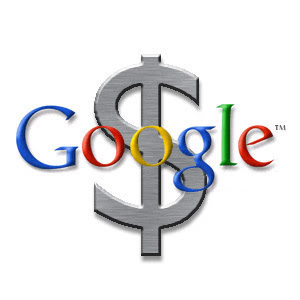 In effect, the Google rebate has become a tool for deliver competitive advantage. Some clients even change their agency on a quarterly basis to ensure that they received the full benefits of the addtional discount. Consequently, agencies have always been heavily incentivised by the growth targets laid down by Google. This has led to large investments in marketing and the sales force in order to acquire new clients. Account management staff have also been targeted on driving additional revenue from existing clients. I believe that there is now the opportunity to re-evaluate these objectives. With less focus on growth and market development agencies should channel their energies internally and start to deliver real value to existing clients through increased efficiencies and more stringent campaign management. The removal of the discount levels the playing field for search marketing as smaller advertisers or those that had a direct relationship with Google never had the luxury of such a discount. They have had to rely on intrcate account management and tactical campaigns to deliver results to clients. There are massive opportunities for product development within search that are lacking investment from the big players. There are large knowledge gaps with regard to effective PPC management that need to be bridged and there is a lot more opportunity for agencies to work closer with their clients and to more shared objectives. For agencies, the removal of the fund is an opportunity rather than a threat. They can now prove that the training and research investments they have made will reap dividends for their clients. Clients will benefit from the increased attention allocated to them by the agency. because by removing the rebate, a clients business, has become infinitely more valuable to the agency. I was reminded today of the film This is Spinal Tap. The film was a spoof documentary showcasing the lives of a semi-fictional glam rock band. Regarded by many as a cult classic, the film was light years ahead of any comedy from it's time and paved the way for comtemporary 'mockumentaries' such as The Office and Operation Good Guys. The clip below is probably the most famous excerpt, but my personal favourite can be located here. Anyone that is involved in the world of search engine optimisation (SEO) would be familiar with the art of link-baiting. For those that are unaware, this is the art of creating content that is so compelling that other webmasters link to it naturally. 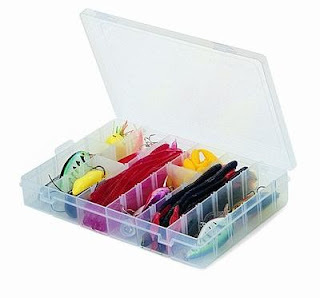 As any online marketeer should know, attracting free links to your website is an invaluable means of meeting your online objectives whatever they may be. There are various mechanisms that companies employ to gather interest in the form of links; Top 10 lists, exclusive interviews, revealing secretive information and prize draws are just some examples. One of the most common, is the art of being controversial. Currently, there are fewer restricions on published content on the web. Writers can almost say what they want to gather links making the art of headline writing crucial. To find an example of link-bait in the offline world, just open up any tabloid newspaper. It's usually packed full of minor celebities that have deliberately placed themselves in situations where they can be captured by the paparazzi. Again, acting controversially gets you noticed. For example, Joey Barton received newspaper space for criticising members of the England football team. Lilly Allen is another that has built a career out of baitng for popularity, most recently attacking Radiohead's decision to release their latest album on a voluntary payment sheme. The art of baiting is not exclusive to the online world nor is it anything new. It is successful in getting sites or people recognised. However does this mean that the public have a better opinion of them? In my view web authors should prioritise engaging users and ensuring they have a positive experience on their site. Just attracting users is no longer enough. Google now need to recognise this and stop relying so heavily on simple inbound links in order to rank websites. I heard today that in Mexico there is a danger of an indigenous language becoming extinct because the two last remaining linguists have have had a disagreement and are no longer speaking. Both are elderly single men and have not passed the language on. This led me to think about how our own language is evolving. Messaging, email and social networking are already starting to replace the telephone and face to face contact. In a work situation, employees will generally always email rather than phone someone in another department. From a business point of view this can lead to departmental fragmentation and a lack of cohesion to achieve business goals. This also extends beyond the workplace. It is not uncommon for member of my household to text / email each other from different rooms! Everyone has a laptop, most of us have different interests. If I want to know whether what if my Dad wants to watch the football on saturday, do I go up to his study and ask him, or do I type this into messenger. Is this lazy or simply more efficient? According to my mother, a teacher, text speak is rife within the classroom - and this is a terrible thing. 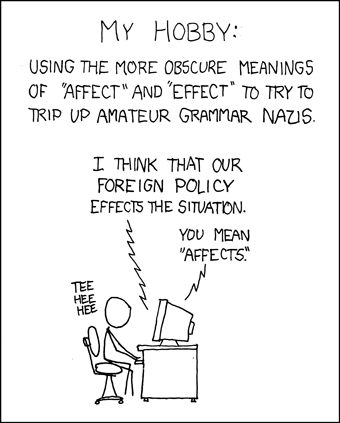 But is it not just a further evolution of the English language? I am sure that at every stage of language evolution there have been some protagonists objecting against proposed shortcuts. Whilst it is ridicoulous to suggest that face to face contact will ever disappear completely, it will be interesting to see the effects of technology on this area in the coming years. I guess we'll find out l8r. 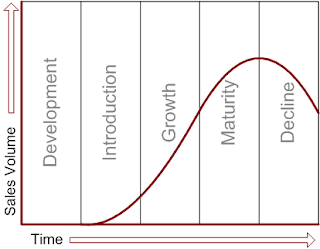 Anyone that has studied for a business related qualification of any sort should be familiar with the product lifecycle. I believe that the product lifecycle for Facebook is teetering on the stage of decline. Sales volume in this example can be treated as time spent using the site, a metric increasingly used by analysts to measure engagement. The development stage happened back in a university computer room where Mr Zucherberg first began his social experment. Cleverly engaging technology savvy students and societies during the introduction stage was perhaps the most crucial for the site. Since Febuary 2006, when Facebook became available to anyone with an email address, the site seen significant growth. Now, I believe that this growth is showing signs of slowing down. There are three main reasons why. The excitement surrounding collecting friends plateaus relatively quickly. Even people that have over 1,000 friends (really?!) cannot sustain this growth. Part of the excitement is connecting with people beyond your standard communication set. This happens over a common platform with limited risk on either side. As the excitement of discovering old friends dwindles, so will popularity. The multitude of different widgets serves more to annoy and frustrate users rather than add any value. I have been bitten by Vampires, had sheep thrown at me and unlimited unwanted items posted on my Funwall (which I do not have). Am I really enjoying this? Facebook is also tainted by it's popularity and addictive nature. A large percentage of businesses now prohibit their staff from using Facebook at work. The ability to communicate from a disparate collection of venues is one of the greatest advantages of Facebook. Once this is taken away, the communication channel is severed. Employees must resort to text messages, email or even (gasp) telecomunication in order to communicate with friends in the workplace. MSN Messnger gained massive traction in the early 00's. A free and easy way for people to communicate from one computer to another. It is still used today but not to such as great an extent. Ebay have now admitted that they overpaid for the Skype and I think the £112M that ITV paid for Friends Reunited is simply ridiclous, but this is the subject of another post. The fact is that product lifecycles can develop at a faster rate online. All of these products were popular when they first launched and, true to the product life cycle, went through extreme growth periods. Before reaching maturity and decline stages, some more severe than others. Because decline and extinction can happen just as quickly. How can successful online businesses avoid this? 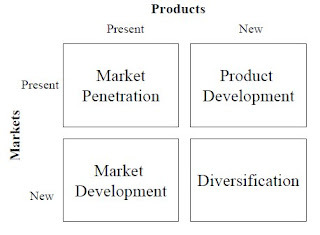 Ansoff famously identified four possibilities for a business seeking to take a new direction. The greatest challenge Facebook has is to either sustain and monetise the existing user base, or cashing in quick by selling stakes to high bidders and moving on to the next great idea, something Google has done with astounding success. This video has caused a lot of interest this year. Following the decision of Time magazine to award the person of the year to "You" it provides an interpretation about the evolution of online content. The sequal, Web 2.0 Judgement Day is due to be released next year starring Governor Schwarzenegger as Sir Tim Berners-Lee. I am currently studying for the IDM Diploma in Digital Marketing. It is really enjoyable learning about the theory and the history of digital marketing. However, it is more enjoyable sharing ideas, opinions and experiences with like minded people that have a passion for digital marketing and using technology to increase efficiency and effectiveness. Overall, I have been very satisfied with the IDM but as I have been progressing through the course. However, I have felt that at times the IDM have not practiced what they preach. I shall elaborate. We have learnt about the importance of having a website that is easy to use from any source. The website Useit.com, from usability expert Jakob Neilson has been cited as an example of a site that has been built with usability at its forefront. However, as I struggled through the online studyware provided by the IDM, I experienced a number of problems specific to usability. For instance, there were difficulties printing diagrams on one sheet of A4, using the buttons in Mozilla, displaying the navigation buttons on the viewable screen and progressing from one module to another. Most frustrating of all was the tendancy to serve a timeout message after such a short period of inactivity. For example, a particular lecture may have 30 slides that need studying. Included in these slides may be links to case studies and articles on other sites. If all this takes longer than 20 minutes then you are automatically signed out of the site due to inactivity. As a consequence, the tool does not recognise your progress, so you are forced to begin the module, lesson or topic again as each element is available on the condition that you have completed the previous one. Imagine a commercial website that would sign its users out of a transactional strand after such a short period of time. After I raised this with the IDM they did extend the time which is a very positive point. Accepting and acting upon user feedback in a manner that is efficent and responsive is a position that many larger websites woudl love to be. Lastly though, I wish they would stop sending me direct mails. Whilst I have no real objection to targeted DM that I have opted-in to receive, asking me to study for the IDM Diploma in Digital Marketing is a bit much. After much speculation, the iPhone finally arrived in the UK on Friday 09th January. Providing you are on the O2 network, the iPhone can be purchased for a mere £269, as long as you are prepared to sign up to an 18 month £30+ contract with 02. Now I may be tempted by an iPhone, my phone is now a bit old and I am constantly bemoaning the requirement to carry my iPod and my phone everywhere I go. However, I am tied to Orange until Feb 2008. Now recently it has emerged that if I was to wait until the French launch at the end of November, I could purchase one in France that would work in the UK. In France it is a legal requirement to launch a de-chipped version of all handsets. Now surely this is a ludicrous situation for UK businesses to be in. Surely people will wait until the French launch and purhase via the internet on such sites as? This is an example of the internet breaking down international barriers to sale and UK business suffering as a consequence. Why is it that early adopters are always punished? In America, the price of an iPhone dropped by $100 after a matter of months. Perhaps the early adopters don't care and they are willing to pay the inflated launch price in order to be the own the latest gadget? If so, I would be intrigued to know if this levarage is built into the product lifecyle as envisaged by Apple. The other day I was invited to a friends birthday party at a fancy bowling alley in the city. Looking at the website, the venue seemed straightforward to find. Following the directions as best as I could, I stuggled to find the venue. AFter a while of walking around aimlessly i decided to go try a number of bars and shops in the vicinity and asked for directions. Nobody I spoke to seemed to have any idea where this place was. I tried phoning some of me fellow bowlers only for phones to go straight to answerphone. After about an hour, I decided to head home. Now from a marketing persepctive, this organisation fell at the last hurdle. It has done all the hard work by attracting the customer with a website and by providing a good experience leading to referral marketing via word of mouth. Modern businesses should not understimate the importance of building relationships with their local communities in order to maximise business returns. Staff at local pubs and restaurants could all be invited to free bowling evening so that they recommend the venue to their customers in the future. Cross-promotional opportunities are also available on the web. For example, "Meet at bar X, the perfect pre-bowling bar" could be emblazoned across the bowling establishment website. I cannot of course alleviate myself from responsibility here. Any sensible person would have printed out a map.